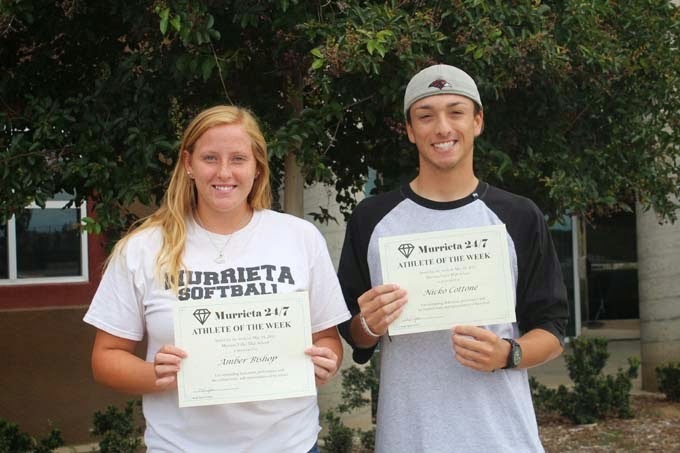 Amber Bishop and Nicko Cottone are the Murrieta Valley High School Athletes of the Week. Nicko Cottone pitched a two-hit shutout for the Nighthawks baseball team, which is 20-8 overall heading into its CIF Division 1 playoff opener at Capistrano Valley on Thursday. He is 7-1 with a 1.92 ERA this season. Junior infielder Amber Bishop is hitting .598 with 10 home runs and 48 RBIs for the softball team, which is 24-6 overall heading into Thursday's home game against Los Altos in the CIF Division 1 playoffs. These athletes will be eligible for selection as Murrieta Valley High School's Athletes of the Month, which will be announced the first week of June. Anyone wishing to order a glossy print of this article with photo may do so by emailing murrieta247info@gmail.com.